Sarah Bonnell, at age 7, and Gabe Sipos, then age 1, had chemotherapy in the same clinic at Vanderbilt Children’s Hospital every week for nearly a year. The two small children bonded, as they shared the same rare cancer, rhabdomyosarcoma. “We knew the original Chemo Duck,” says Sarah’s mom, Diane. Sarah and her family wanted to share that comfort with other kids going through a similar experience. 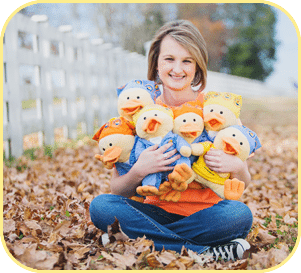 Together with Lu Sipos, creator of Gabe’s Chemo Duck program™, they created “Sarah’s Six.” Each month, the family funds six Chemo Ducks for delivery to children at three U.S. hospitals. “We’ve always been inspired and humbled by Lu’s work,” says Diane. “We’ve watched in awe as she’s built and devoted her life to her foundation, and though we’ve made contributions from time to time, we decided we wanted to make a commitment to do more directed giving. Sarah chose Vanderbilt Children’s Hospital to receive the first round of Sarah’s Six Chemo Ducks, in honor of the life-saving care she received there. Thereafter, a monthly contest sponsored by Gabe’s My Heart will invite supporters and fans to designate three hospitals to receive Sarah’s Six each month (plus all other single duck orders place that month). You can create your own personalized form of directed giving like the Bonnell family did with Sarah’s Six. To learn more, please email us at info@chemoduck.org.